Problems faced while shopping with kids - Solutions for every problem! Shopping– what happens when you hear this world? Well, half of us fear as shopping is one thing which can add to our expenditure unnecessarily at times. On the other hand, shopping is also necessary at times. For instance- when you have the month approaching an end and you have to go grocery shopping which is next to a nightmare, endless listing of products required for the house and demands which also should be kept in mind. Every household has special demand every month, where kids would expect you to get them candies and no energy booster drinks and you would want to stick to low cholesterol oil for your family. There are a bunch of us who wish to go shop alone, and on the other hand, there are people who can’t just go shopping alone. You might have experienced your friends dragging you for their retail therapy every now and then. But, have you ever imagined how it would be if you have to go shopping along with kids around? I would have never imagined myself in those shoes, but it is sometimes commendable to see parents in the shopping malls tackling their kids at the best. Parenting is different school skill altogether, here no one teaches you anything. You just learn tips and tricks of handling your kids with time and of course from their grandparents and their experiences. Women have been always trolled everywhere for their shopaholic nature, however, when it comes to a mother it is a different experience altogether. The shopping time doubles when you have a kid with you because you have to take care of their snack breaks, their mood swings, and their pee breaks. Well, there are other additional problems faced while shopping with kids, which has been elaborately discussed here. It is difficult to manage at times however both the parents handle the kids turn by turn and that’s how we finish the shopping in a month for another month maybe. There is no school which can help you master in parenting, trust me when I say this. Parenting is a skill which we learn with time and experience in life with kids. Every one of us would have encountered kids of different varieties in the shopping malls or shops near-by. There are some kids who would be engrossed in playing and their parents would be peacefully shopping around, with definitely one of them eyeing the kid even from a distance. Well, we also have kids who would be crying their hearts out for one toy or the other. You would hear a screaming parent running with the crying kid to make him/her smile. Then, comes to those cutie pie dads who are silent spectators in a shopping mall talking in sign language with a fast-asleep baby in their arms. It is amazing to see how we change our lifestyle with a kid around us. However, we have some amazing hacks to take care of your kids while you shop around for family and self. Meanwhile Let’s first discuss the major problems faced while shopping with kids. Parents suffer from some embarrassing moments of their lives with kids. Kids run around the shopping malls creating ruckus at times. You might have encountered kids go around the mannequins and trying to look beneath the clothing. Kids also bring embarrassment when they start hitting on their mom for milk amidst a mall. Have screaming kids ever got on your nerves? Every one of us would have encountered a cranky kid anywhere we go maybe a shopping mall or a stroll by the park. Most of the times, parents have to suffer because of the cranky behavior of the kid. Kids scream cry out their hearts sometimes giving a tough time to their parents. There might be passersby giving irritated expression to the parents on their kid’s cranky behavior. Some of the kids behave weirdly when they step out of the house, where they want to demand people’s attention. You must have seen kids rolling on the floor of the malls creating trouble for their parents. It is difficult for parents to control the kid at times which ends on ruining their mood at times while shopping. A hungry kid can be dangerous while on a shopping spree. 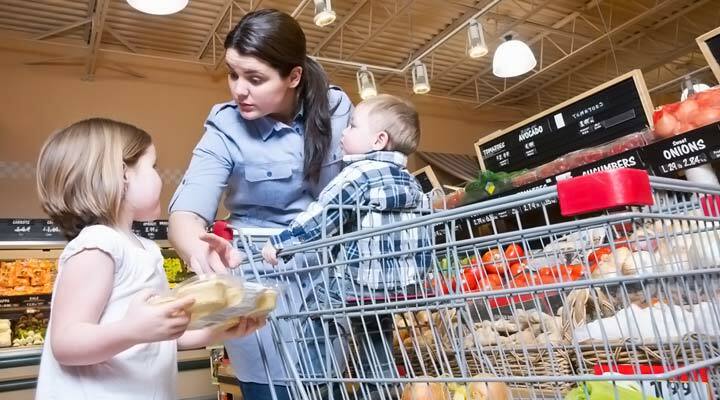 Hunger spams are one of the common problems faced while shopping with kids. Kids start screaming on top of their voice which halts the shopping session. At times, the food fails to please the child and you have to rush home in order to sooth the mood of your child. Kids give tough time to their parents sometimes, when the devil’s mind starts working. While shopping, they can cause property damage at the mall by throwing breakable items. This causes an additional pinch to the parent’s pocket. Solutions for every problem faced while shopping with kids! Distraction is the key to winning the attention of kids. You can always distract kids with some fun games, which can be a word game related to different items around the shopping mall. These fun games can be educational which can also help the kid in understanding few unknown things around. Games are always engaging for the kids and in this way, you can grab his/her attention while shopping and they won’t even get bored with the long shopping sessions. Every woman always carries a bag for a certain reason, not that they want to show-off their collection. A woman’s bag is equivalent to a Narnia wardrobe, featuring a stapler to a wet-wipe. When you are out for shopping with a kid, you should be carrying a bag or backpack with all the necessary items such as water bottle, your kids favorite toy, snacks, chocolates, and some towels. You can assist any demand of your kid amidst the shopping session with the help of your immensely well-equipped purse. When shopping with infants it is advisable to carry milk bottle (needless to say that), extra clothes and diapers. Well, everyone knows bribery is bad practice. However, there is no escaping from this when you are shopping with a cranky mood kid. It often happens that the child’s sleep is disturbed due to the shopping sessions and he/she turns irritated with the disrupted sleep session. So, it is advisable to grab the attention of the kid with a reward program. You can propose a situation where if he/she remains at good behavior they could go to a place of their choice next time or they would be rewarded with ice-cream or anything of their choice. Reward programs turn out to be the best option for the problems faced while shopping with kids. Shopping malls today offer a variety of options which help in engaging the kids while the parents continue their shopping. You can take your kid to their favorite corner in the mall such as gaming arena, ice-cream parlor or garden area. This helps in lightening the mood of kids for a while and you are free for another few hours as he/she would be energized after visiting their favorite location. We always prefer taking our friends while we go shopping as it helps in deciding on things quickly. You can take along your friends who are single, they would help in engaging the kids and act as babysitters, without their knowledge even. Or you can also invite your friends who have kids so that you guys can leave the kids playing around together and your spouse will have a shopping buddy while the men can hang out looking after the playing kids. Grandparents tackle kids the best, as they have experience of handling numerous children issues. They can come as a life-saver while you continue shopping for the family. Grandparents and kids are a great combination on any trip or shopping sessions. The affection with which they take care of the kids is impeccable and they also care about your shopping hours handling problem faced while shopping with kids. A hunger kid will always bring destruction you must remember this as a parent. It is very important to have a good lunch before you begin your shopping session. Kids have a faster metabolism so it is your responsibility to check if the kid is hungry amidst your long duration shopping. A bit of snacking in between the shopping session causes no harm. You must help out the kids making them shopping ready. It is necessary for them to wear clothes which make them comfortable. You must also ensure that they are wearing comfortable shoes such as sneakers or crocs which don’t hurt them. There is a lot of walking and running around involved in shopping malls. You can make your kid sit around with the bags while you continue shopping or even going on trials handling the problem faced while shopping with kids. Giving the kids responsibilities makes them feel privileged and there are no more tantrums thereafter. They become responsible for that little while and help you out with the shopping session quite peacefully. You must enjoy every session spent together with family. Sometimes, these breaks are the only breaks that you might get with your family due to the hectic work schedule. So, you must make the most out of it. You can go for a drive or dinner after the shopping session or even for a movie of your kid’s choice. In this way, you can work on the reward program offered to the child and also spent quality time with them on weekends. The happiness which comes in bits and pieces must be cherished.